A record number of schools took part, with 69 teams and 340 children participating from 23 different schools. 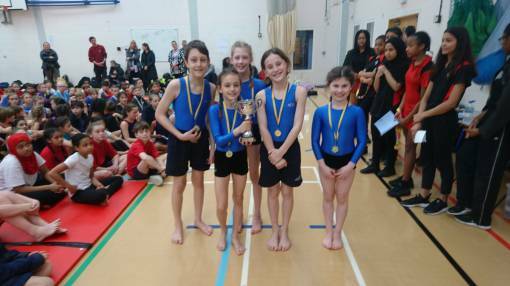 Nick Miller from Southfields said 'It is amazing to see how the standard of the gymnastics of the children across all the schools has improved dramatically in the last few years'. This was reflected in the fact that 9 different schools won medals in the for competitions." Congratulations to Riversdale who were the winners in the Year 3/4 competition and Honeywell for winning Y5/6 event. We wish both teams the best of luck in the London Finals in July. Teachers were also asked to select one gymnast from their school who had demonstrated outstanding School Games Values of Self Belief. Thanks to Miss Myers from the Southfields Academy PE Department and our sports leaders from Graveney and Burntwood for judging the event and helping as table officials.